In 2011, Guitar Salon International founder and CEO Tim Miklaucic created the GSI Foundation, a non-profit company based on the simple idea that every child deserves a musical education, regardless of their social background. Like most of you reading this, he was lucky enough to grow up with music in his home as well as at school; his children also have had the same good fortune. However, they seem to be the exception rather than the rule, as public schools in our country have reduced funding for these crucially important programs in recent years. As a result, many children have no musical experience, except as consumers or listeners. While the GSI Foundation alone cannot solve this nation-wide problem, with your help, we can do our part to make a difference. “Music Matters: L.A. Kids and their Music” won the 68th Annual Los Angeles Area Emmy Award for Outstanding Achievement in Children/Youth Programming. The award winning documentary featured dozens of LAUSD elementary students supported by the GSI FOUNDATION. The film also included an on-camera interview with Tim Miklaucic about the importance of music education in our public schools. We began 2018 by working together with the non-profit Guitar Fort Worth to donate 16 Cordoba guitars along with the footstools and strings needed to set up two new guitar programs in Fort Worth, Texas. In May, we sponsored a group of students to attend the very first Los Angeles Guitar Festival where we also presented a workshop on "Effective Practice." For the current school year, we have provided funding for another year of lessons once a week at Brockton Elementary and started a new ukulele program at Castle Heights Elementary School, once again working with Cordoba to provide the program with instruments. In addition, we provided scholarships for a group of low-income students to attend Elemental Music, a local non-profit that provides high-quality music education for young children. In 2017, we initiated a new ukulele program at Brockton Avenue Elementary School in Los Angeles, contributing $12,000 to pay for one year of instruction along with 30 ukuleles in cooperation with Cordoba Guitars. This year, we also donated $2,000 to help fund the Calvert St Elementary PTA Orchestra Fund. Finally, a scholarship fund was created in partnership with the GSI Foundation, Children's Music Workshop, and The Instrument Place – where instrument rental fees were waived for scholarship recipients. In 2016, working in conjunction with the Children's Music Workshop, we gave a large round of support for both the Calvert Street Elementary and Micheltorena Street Elementary schools. At Micheltorena, this included partial funding of the orchestra program, as well as full funding of the second grade ukulele and recorder program (included instruction, books and instruments for all second graders in the school). At Calvert St Elementary, this year’s funding supplemented PTA donations that established a full orchestra program for all students in grades three, four and five. At both programs, a reserve fund was created to take care of instrument repairs. In 2015, working with the Children's Music Workshop, we continued our support of the orchestra programs in elementary schools at both Calvert Street Elementary and Micheltorena Street Elementary schools, providing badly needed funding. The GSI Foundation also graciously donated a pallet of instruments including ukuleles, guitars, and violins to Decatur Classical School in Chicago, Illinois. 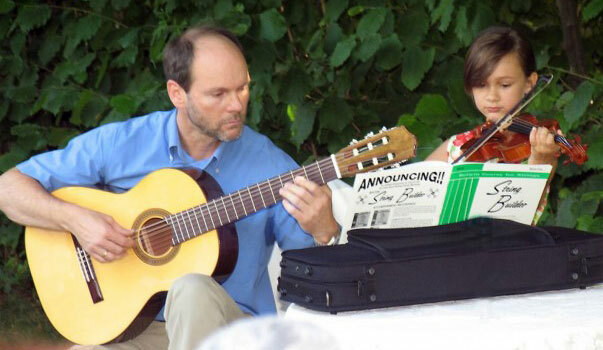 Following the donation, parents and teachers raised money to hire a music teacher. In 2014, we donated substantial funds, violins, guitars and ukuleles in collaboration with Children's Music Workshop, to sustain the music programs of both Calvert Street Elementary and Micheltorena Street Elementary schools. Our support allowed more than 200 students to experience creative musical expression where it was scarce before. In addition, a pallet of violins were donated by the foundation to The Instrument Place, who in turn rent these instrument at well below market rates to low income families whose children have expressed interest in the violin. In 2013, we donated almost $7,000 worth of guitar accessories to the Fender Music Foundation, and also donated instruments to the Archer School, Palisades High School, and the Museum of Making Music. In the same year, we raised substantial funds and successfully saved the Children's Music Workshop orchestra programs for Sendak Elementary in North Hollywood as well as several inner city elementary schools in the San Fernando Valley. In 2012, we provided 50 guitars to a music program at the UCLA Community School. In 2011, we made a $25,000 commitment to help fund the Cal State University Northridge Music Center for Performing Arts. That same year, we provided instruments including violins, guitars, and related accessories to other schools in our community and within the LAUSD.